5 months, 25 Cities in SGD$10,000 | Tips for International exchange on a budget ! One question everyone have been asking me recently..
HOW MUCH DID YOU SPEND ON EXCHANGE? Haha i'm not gonna lie.. I am actually VERY proud of myself and my planning skills because... I spent around SGD$10,000 on my exchange! And yes, I know $10K is not a small amount. Let's face it, it is quite a huge sum of money and not many have the luxury of being able to fund a 5 months long trip of living and touring abroad. But SGD$10K for 5 months worth of living expenses, inclusive of return flights with Qatar Airways (pretty decent airlines), rent, food, transport and traveling to almost 25 different countries and cities.. I must say it's really quite a reasonable amount. Ask your friends who have been on exchange, how much did they spend? I've asked almost all of my friends who went on exchange. For those who travelled as much as I did in Europe, they spent an average of SGD$15K to 20K, others who didn't, spent less at around SGD$12K to $15K. So.. $10K is not too bad la right? Okay so here's to all of my lovely readers who are currently on exchange now, or are planning to apply for the programme, I hope this post helps you in some way! So, if you've been following me on my social media pages, you will know that these are the places I visited over the course of 5 months. 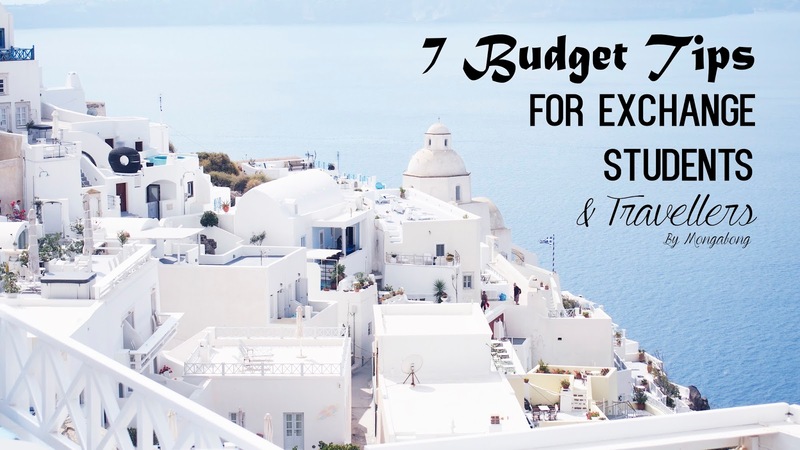 Here are some tips I have to go budget on exchange, some might not spend only $10,000 while others may not even need to spend as much as that, these are purely the tips I stuck by while planning for my trips and what I found was the most cost-saving for me. But by planning "properly" , I mean really go into the details of everything from having an entire excel sheet of "homework" done before hand. What I did for 90% of my trips was, I jotted down the exact locations of the places of interest on google maps, noted down the bus routes, metro lines etc, and worked out all the costs for all the transportation, attraction fees etc. Having it in an excel sheet that is synced to your dropbox (on your phone) really helps. Not only will it keep you on track with your schedule, it also reminds you of how much you have budgeted for the trip so that you don't overspend. Another great tip is to know what you/your travelling partner likes, if you guys are not into arts or museums like me, I would recommend you not to spend money on those entrance fees, because they are pretty pricey! To me, no matter how high it is ranked on tripadvisor, I wouldn't be able to appreciate them anyway, and I know for sure because I've been to soo many of them already. None of them left deep impressions of me at the end of the day. So what I would do is to visit the area of the museum, snap some photos (they're free!) and spend the money on what I know I would enjoy better. I love food and I enjoy trying the different foods in different places, with the money saved on musuems I'm not interested in, I can budget more for better food and drinks! Planning your travelling route properly might come as a no-brainer to some of you, of course, everyone knows how a poorly-planned trip can go haywire. In order to save money on flights, I opted for a 3 Months Eurail Global Pass which I got from STA travels in Singapore for SGD$1,700. After doing much research, I knew that I was going to be benefitting from the Global Pass because I knew I was going to be taking a lot of train rides in and out of Grenoble during the school term. And more importantly, I knew that train prices would skyrocket during the holidays (Christmas and New Years) and that was when my pass came in really handy. The Eurail Global Pass mainly gave us access to free train rides for shorter duration travels. I took that and made sure I planned my route in a way that required me to pay as little reservation fees as I could. Likewise for you guys who are not intending to get the Global Pass, shorter trips = cheaper tickets (generally), book your tickets early to get them at cheaper prices too! Budget airlines like Ryanair, Easyjet and sometimes even non-budget airlines have promotions quite frequently on their sites, so download their applications and check skyscanner frequently. Sometimes the deals can be so ridiculous! I know of friends who manage to book their flights for only 10 Euros. Unbelievable! This is probably what saved me the MOST money over my time in Europe. For my entire time in Grenoble, I cooked all 3 meals everyday and each meal probably costed only SGD $2 to $4, depending on what we have on that day itself. Some restaurants in Europe charge really exorbitant prices, so it is always good to know how to cook a few good dishes when you're away from home! Attractions in Europe are mostly all situated in one area, and getting from place to place is generally accessible by foot. Walking in Europe can be quite tiring sometimes, but you get to exercise, see a lot more, and save money! Matt and I relied heavily on Airbnb when it came to our travels because it gave us a lot more accommodation options at much cheaper prices. If you guys don't mind sharing the room or just renting a room in a house with other local tenants, opt for the shared room or private room and prices can sometimes go as low as only one-fifth of the local hotel prices! Otherwise, there are a ton of good hostels in Europe such as YHA, the youth hostel we stayed in both London and York which costs only SGD$30 a night. So yes! There are many other options to cheaper accommodations if you're looking for something budget. Otherwise, if you're game enough, try Couch surfing as it is free! Couch surfing allows you to stay with a local, where the local house owner allows you to sleep on his couch or floor for free. Well you all know that if I only spent $10,000 altogether for my trip, you guys should know by now that I didn't buy anything nice for myself this trip, even though I went to the fashion cities like Paris and Milan. So here are my 7 tips to go budget while on exchange! Travelling doesn't mean you have to spend tons and tons of money, there are many ways you can save money even in expensive countries in Europe! Could you tell me where you stayed in for Brussels and Amsterdam? Which hostel and stuff?